I appreciate a good film or play, but I've never been able to wrap my head around what drives actors to do what they do. It makes me feel all cagey just thinking about people looking at me. So I asked an actor about her chosen art form to better understand the work and creativity involved. Meet my cousin Lola Jaye. What's the coolest person/thing you saw at Comic Con? 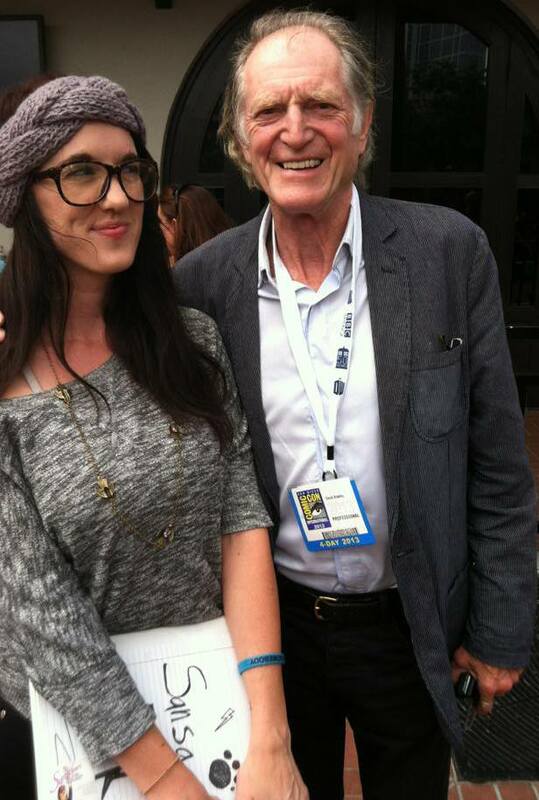 The coolest person I saw at Comic Con was definitely David Bradley, who plays Argus Filch in the HARRY POTTER movies and Walder Frey on GAME OF THRONES. He plays such a creep but he was a total sweetheart and took a picture with me. I was also a huge fan of the Kaiju and Jaeger statues from PACIFIC RIM at the Hot Toys booth. They looked amazing. There's a freedom in getting to be someone else. It's exciting to shed your skin and let something else take over. Playing villains is the best. You get to feel things and say things that most people never get to do, and the audience really feeds off of it. It creates an atmosphere where everyone is connecting over this totally fake situation and it becomes real for a few minutes or hours. When you act, do you really feel like you're a totally different person or just a slightly different version of yourself? You have to base every character on yourself a little to keep it real. Even if you're playing a murderer or a weirdo, you have to remember a time you were so angry you wanted to kill someone, or really focus on something weird you say or do. How do actors prepare for a show? Do they have creative rituals to help them get into the acting mindset? Some people literally refuse to respond to their own name and walk around as their character backstage. It's called method acting, and I'm not a huge fan. Some people will do little emotional exercises where they remember times they felt the way their character feels to get those emotions on the surface. Some people just go about their day right up until they go onstage and then step right into it. What do most of us not know about acting that you wish we knew? It's hard, hard work. You memorize an entire book, add emotions to it, try not to trip over anything onstage or accidentally punch other actors, and you have to do it with all the adrenaline in the world shooting through you. I had a teacher describe it as trying to present an oral exam while being mugged. How much do scripts define the characters you play and how much do you get to define the character? Most of the time, you have to use the rehearsal process to really figure out who you are. It can change throughout rehearsals and even during the run of the show. My characters on closing night are never exactly the same as they were on opening night. Every time. I'm fine right up until the moment I step onstage and then I feel like I'm going to pee my pants and think "I've forgotten all my lines." How do you improve your craft? Constantly pushing yourself. If you're not scared of what's happening or worried that you've gone too far or tried something out of your league, you're not doing enough. When you start to feel safe, you're doomed. When did you discover you liked acting? I guess I always knew. I remember being so mad when my friends wanted to stop pretending as kids and wanted to grow up too fast. I just wanted to pretend to be other people and have crazy powers or be a cat or something. I can't wait to play someone with magical powers someday. Thanks, Lola! Hey, remember the time we made that awesome haunted house in your backyard? In June? That was some good acting. The only other time I've pretended anything since then was when I got to be Debbie Gibson last Halloween. It scared the children. Now a few questions for the readers. What villain would you play if you could act? And what are you going to be for Halloween? It's only three months away.